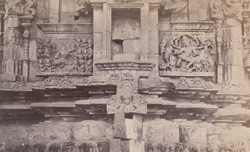 Photograph of sculpture panels and mouldings on the wall of the Kashivishveshvara Temple at Lakkundi, taken by Henry Cousens in the 1880s. Lakkundi is situated in the modern state of Karnataka. The Kashivishveshvara Temple was built in the late Chalukya style and dates to the 12th Century. It is a Hindu shrine and is also known as the Kashivishvanatha temple. It is the most ornate of the temples at Lakkundi and consists of two sanctuaries that face each other, connected by an open porch. The walls recesses are decorated with pilasters capped by miniature temple towers with very elaborate toranas or with makaras, aquatic monsters with foliated tails. Most of the niches that contained icons are now empty but maidens and attendants are carved between the pilasters.